Congratulations on Obtaining Your Motorcycle Learner Permit! Thank you for starting your journey with Ride-Tek Motorcycle Training Academy. Vitally important that you purchase a motorcycle as soon as you can and continue to develop your skills. Stay around your own neighbourhood and ride your motorcycle as often as you can. Try to get in 30 – 45 minutes at a time. This way your basic control skills will become “muscle memory” and you will develop your confidence on the bike as you develop those base skills. With more confidence, think about getting out into traffic on a Saturday or a Sunday afternoon as this will introduce you to heavier traffic volumes in a manageable way. TWO STEPS TO ATTAIN THE LICENCE – YOU HAVE 15 MONTHS! CHECK RIDE —3.5 hours compulsory group training session, on range and on road. – Use of own bike and gear. You can enrol for your Check Ride as soon as you like after completing your Learner Permit – so give our office a call when you’re ready. 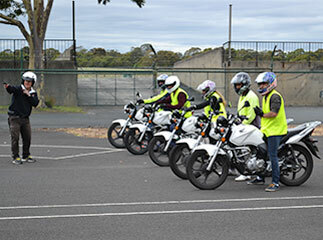 LICENCE ASSESSMENT —1.5 hours, 1:1 with instructor , briefly on range & mainly on-road — Use of own bike and gear. How soon can I have my Licence Assessment? No earlier than 3 months from issue of Learner Permit and at least one month from date of Check Ride. Please also remember that it is vitally important that you ALWAYS wear appropriate protective clothing when you ride. (ATGATT) – All The Gear All The Time. Finally, we are always available for advice and can offer further skills and on-road training. Just call our office on 1300 788 382. Ride Safely and Enjoy Your Journey!